Back in the day, my maternal grandmother used to have a ‘wringer type’ washing machine. She kept it outside, on the back porch of their old house, like most people did, back in those days. Grandma didn’t have a hot water heater, so she had to heat the water for washing clothes in a large wash pot, outside, with a fire built underneath it. After the water heated, it was then poured into the tub of the washing machine, where the clothes were then washed. After the clothes finished washing, each piece had to be ‘fed’ through the ‘wringer’ to squeeze the excess water out. (It would be a bad day if a piece of clothes got wrapped around that wringer, or if your finger got caught in it!) The clothes were placed in a large metal washtub as they came through the ‘ringer’. The clothes were then rinsed, and fed through the ringer again. Ultimately, the clothes were hung out on a clothes line to dry. Needless to say, doing laundry took up most of the day! Grandma finally got her first automatic washing machine in the mid sixties, when she was probably in her mid sixties! In those days, everything was cotton, which meant it had to be ironed. Mama had a sprinkler bottle, which consisted of a glass coca cola bottle, with a cork and metal sprinkler top, that she used to ‘sprinkle’ the dry laundry. After she sprinkled the clothes that needed to be ironed, she’d roll them up so they’d get damp all over, then she’d proceed to iron them, one piece at a time. Mama never sprinkled more than she could iron at one time, because the clothes would ‘sour’ if they sat too long. When Ed and I first got married, we didn’t have a washing machine. This meant we had to spend a portion of every weekend at the laundromat. It wasn’t long before we scraped up the money and bought a small washing machine of our own! However, it was several years before we were able to afford a dryer to go along with it. I have some not-so-fond memories of hanging out laundry, in the dark, after a long day of work! Did I mention that Ed’s work clothes were all white, too?! The years passed, and our family of two eventually grew to a family of five. We required two laundry hampers, and they were usually full at all times. It was SO hard to keep up with all of the laundry! I was very thankful for my extra-large capacity washer and matching dryer, as well as the permanent press materials that most of our clothing was made of! I never owned a sprinkler bottle, but I did have a plastic spray bottle and a can of spray starch! Now that it’s just Ed and me, laundry is a lot easier to keep up with. Since we’re retired, we don’t worry a lot about wrinkles, unless we’re going somewhere. We hang our clothes up after they finish tumbling in the dryer, and most of the wrinkles are gone by then. However I still hate putting wet clothes into the dryer–and I still hate folding the dried clothes, and putting them away. In fact, there’s a load on the couch, waiting to be folded, now. Shame on me! I’d better go and get busy. Thirty-nine years ago, today, Ed and I moved to Ed’s parents’ farm, after living in the city for almost five years. It was the best move we ever could have made! I’ve told the story before, of how Ed and I moved away from our hometown as soon as we got married. We were so happy to be on our own, and loved the big city life…for a while. I also told the story of how our car and our home had both been burglarized, during our years of living there, and how we knew we were getting ready to start our family, but had no desire to raise children in the city. The years passed, one thing happened and then another, and before we knew it, Ed’s daddy offered to give us [our choice of] a plot of land, if we’d move back home to the farm. It was an offer we couldn’t refuse. We chose the ‘back field’ for our new home, and planned our move on St. Patrick’s Day, 1977. Of course, our “Bacon luck” came into play, and our move didn’t go smoothly. We didn’t realize, until we were already in the actual process of moving our mobile home, that we would not be able to have access to electricity for another three weeks! Since we’d be the only ones coming off the main power lines, a ‘reducer’ was necessary. There was nothing else to do, except move in with Ed’s parents until our new transformer arrived and could be installed on a power pole close to our home. To this day, I still remember sitting in the front living room of my late mother-in-law’s house, crying because we couldn’t stay in our home. I also remember how Ed’s mama sat with me, and tried to console me. I remember the ten gallon aquarium of fish we had to set up, temporarily, in Ed’s old bedroom of his parents’ house! His mother never said a word, but was probably dying a little inside, as we set up the aquarium–on top of Ed’s dresser! I tell you, she was a special lady. Eventually, the power company did get our ‘reducer’ installed, and we were able to finally spend the night in our home. We had the entire back section of the family farm to ourselves. Our only neighbors were some goats and a few cows! We’ve always considered our place to be a little slice of heaven [on earth], and many who’ve visited have commented on what a beautiful place it is. A lot of things have happened since that fateful day, thirty-nine years ago, when we moved back home. Ed and added on to our mobile home twice, then, finally, remodeled the structure and removed the mobile home entirely–one piece at a time. We became parents three times, then raised a daughter and two sons. Ed worked at four different hospitals. I stayed home and raised our family, with the exception of the sixteen and 1/2 years that I chose to work. We built a game house next door to us, then, decided to add on to it and make it our new home, in 2007. We lost all four of our parents, but gained a son-in-law, two daughters-in-law, and four grandchildren. I had three surgeries. Ed suffered a heart attack, and had cataracts removed from both eyes… We both now require several daily medications to control chronic health issues… and life goes on. Ed and I are the patriarch and matriarch of the family, now. We have no idea how many more years we’ll be blessed to enjoy our little slice of heaven, here on the farm, but we’re sure trying to make the best of the time we have! We have some chickens and we grow our own food. We’re SO grateful to Ed’s daddy for offering us the opportunity to share his farm as our home. We’ve paid it forward by extending the same offer to all of our own children. Two (out of three) children, and their families, currently share the farm with us. Happy moving day anniversary to us! For now, life is good. Tomorrow will make one week since Ed lost his job–and what a week it’s been! As you can imagine, we’ve experienced all kinds of emotions this week–shock, anger, disbelief, fear, sadness, and relief, all rolled into one week! I’m happy to say, as the week has worn on, relief has become the most prevalent emotion in our household. Seven years ago, Ed was happily working at another hospital. One day, EMH contacted him and asked if he might be interested in coming to work for their hospital. Although Ed was happy with his current job, the hospital where he was working was 55 miles from home, which meant a two-hour commute every day. EMH was located just 7 miles from us, and offered a higher salary. It wasn’t an easy decision for Ed to make, but, ultimately, he chose to take the job at EMH. It didn’t take long to figure out that he might have made a mistake. While the commute was much shorter, and the pay much better, the working conditions were much more stressful, and, over time, they just got worse. It was the worst working environment Ed has ever experienced, in his forty-three years of employment! Some of the problems included poor hospital management, lots of back-biting and back stabbing among the staff, not to mention poor morale among ALL employees. Due to the government’s involvement in healthcare, times are tough for small rural hospitals, with most of them really struggling, these days. Not long after Ed took the job at EMH, it became apparent that this hospital was struggling, as well. Years ago, Ed had worked [for twenty years] at a hospital that ended up having to close its doors, so he knew all of the warning signs. The same scenario was beginning to play out at EMH. At the beginning of last year, it became apparent the hospital wasn’t going to survive, unless some drastic changes were made. By the end of the year, a management firm had been hired to take over running the hospital, on a trial basis, for one year. We had a pretty good idea of how the next scenario would go. Employees were warned that ” some cuts would be made” when this company took control. In hindsight, we’re now beginning to view what we considered “the worst” as a blessing. Living and working in stressful conditions can eventually take a toll on one’s health, and Ed was no exception. In the wake of this particularly stressful past year, minor health issues had begun to plague Ed. I feared for his over-all health, and joked with him, at one point, that he was going to stay at that hospital until they carried him out on a stretcher. Fortunately, that didn’t happen! As each day passes, Ed looks better and better. He says he even feels better. He looks like a man who has had the weight of the world lifted off of his shoulders, and, perhaps, he has. Perhaps a better analogy would be this: After years of riding on a sinking ship, Ed finally got tossed a life-preserver. May he happily find his way to the shore of retirement bliss, and live happily ever after! When I woke up on Wednesday morning, I’d been having a dream. In my dream, I was talking with Ed’s mom. I don’t remember our conversation, but I do remember her voice, clear and strong. It’s been a little over a year since I’ve heard the voice of my mother-in-law, Vivian. Hearing her voice again, even if only in my mind, suddenly caused me to be a little nostalgic. I thought about all of the good times mine and Ed’s families had together, over the years. There were lots of cook outs, birthdays, holidays, and, yes, even ordinary days. A line from an old song comes to mind, “Those were the days, my friend, we thought they’d never end…” But all good things come to an end, don’t they? One by one, our parents passed away, and the special times with our parents eventually ended. These days, family functions only involve Ed and me, along with our grown children and their families. I think our children are now old enough to realize these family times are ‘memories in the making’, but I doubt our grandchildren do, yet. One day, even the ‘grands’, will look back and remember, fondly I hope, fun times spent with family, or fun times spent with each other–long after Ed and I are gone. 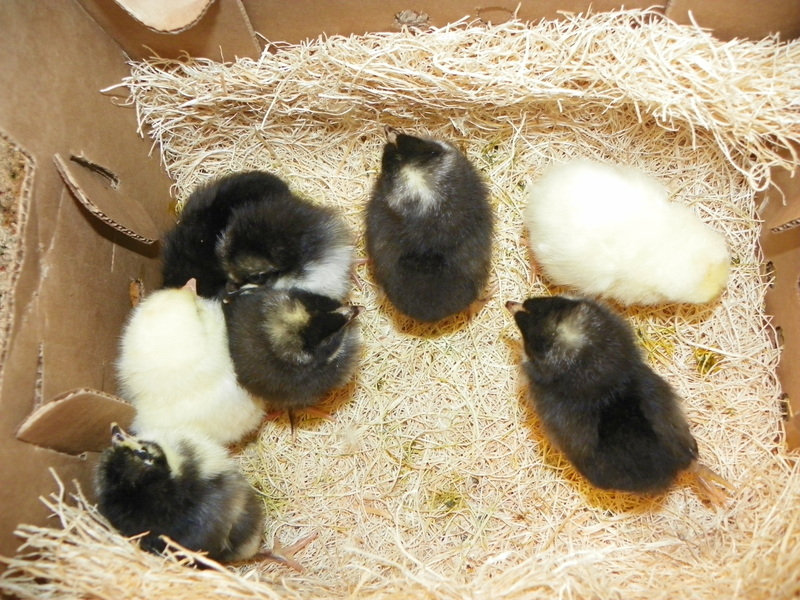 It’s hard to believe it’s been almost six weeks since I received the box in the mail containing eight fuzzy little baby chicks. 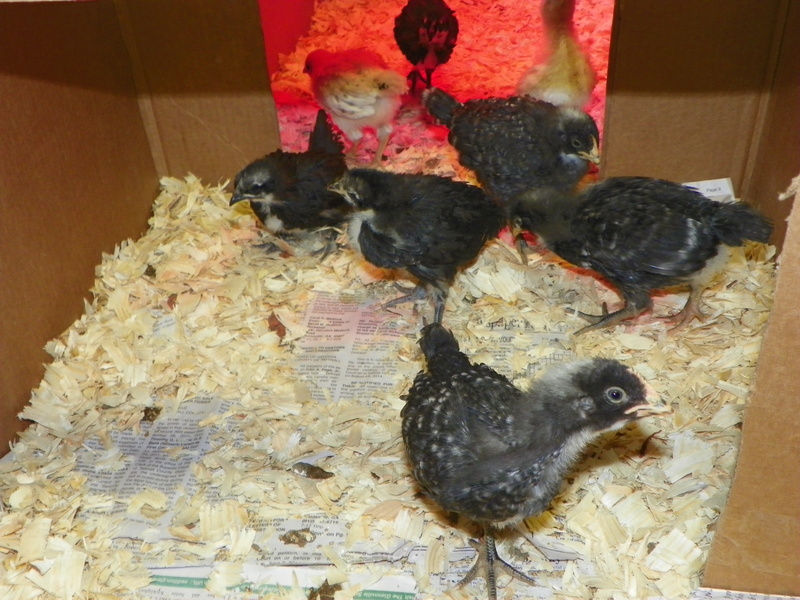 All of the chicks, except one, grew like weeds and have been thriving. Sadly, I lost one of the little white chicks, named Della. 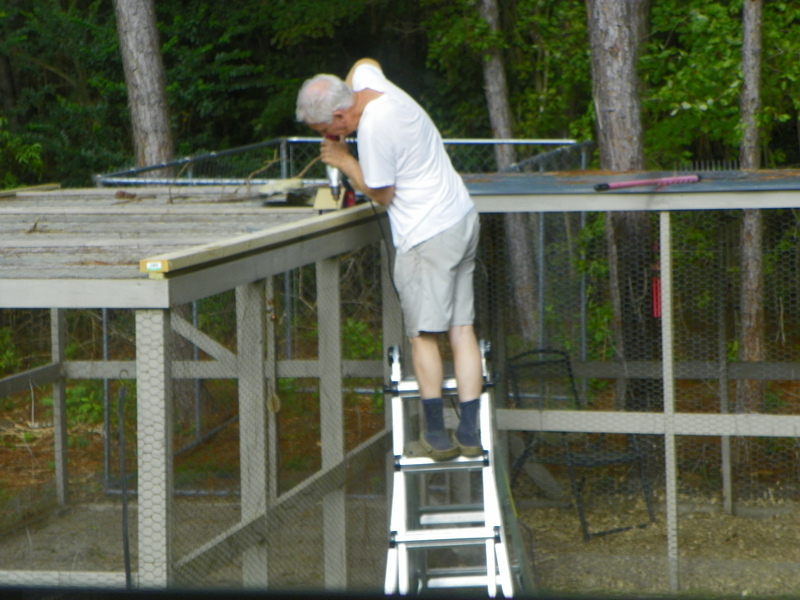 Once the chicks arrived, my hubby, Ed, got busy renovating a place for the new baby chicks to live. Ed had to add a tin roof to an existing chicken run, then build a new chicken coop for them to sleep and lay eggs in. 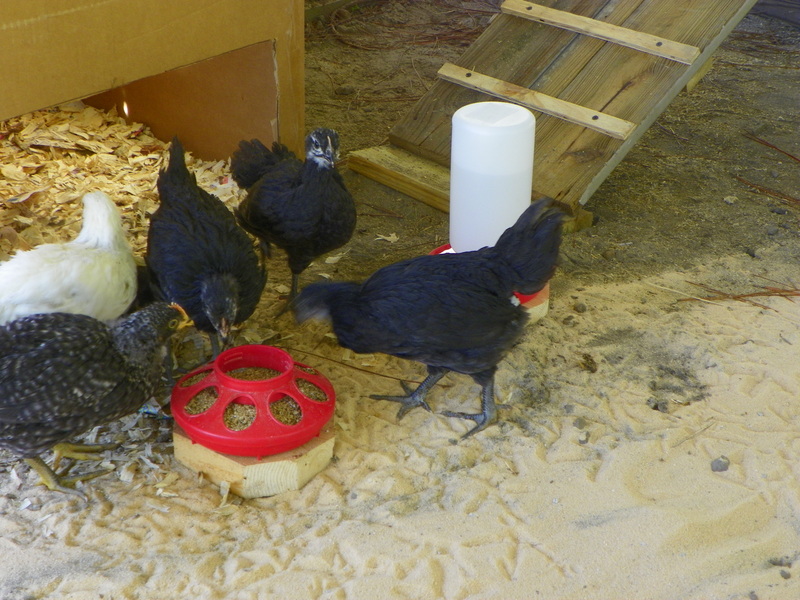 In spite of a few setbacks, this past weekend, Ed finally completed the new coop enough so the ‘new girls’ could move in. He still needs to build some perches, and add window coverings, while I need to paint, but we can do that this weekend. I designated Monday, of this week, as ‘Moving Day’, so I went outside and prepared the coop with a light and some fresh shavings. Then I removed one of the smaller cardboard boxes from the end of the ‘chicken condo’, where the chicks had been living (in our pool room) for the past five weeks. About this time, it hit me that the cardboard box might not fit through the door of the chicken run! I held my breath as I quickly carried the [rather large] box containing the chicks outside (and past several curious cats)! Luck was with me, because the box fit through the door–barely! Another quarter of an inch, and I’d have been in trouble! Monday was a warm, sunny day, so I just sat the cardboard box inside of the chicken run, and pulled myself up a chair. Before long, the girls were darting in and out of the box exploring their new surroundings, while I sat and watched. 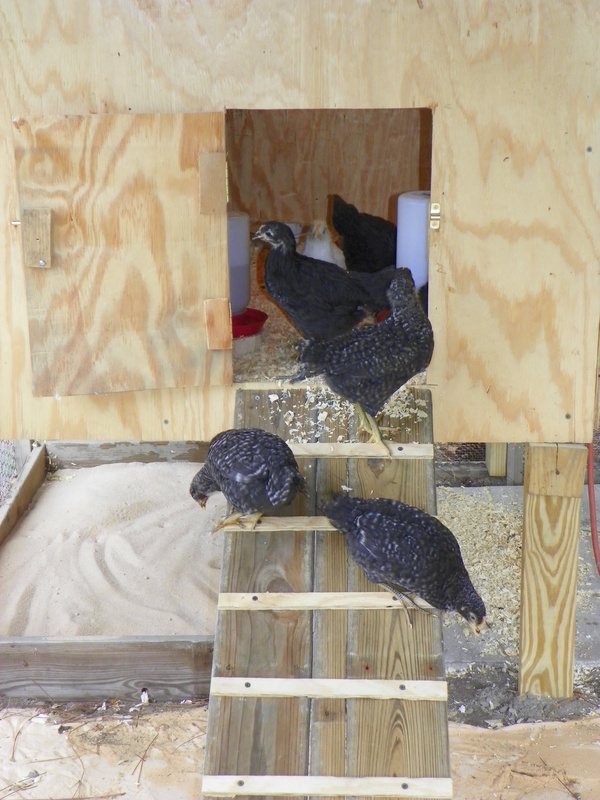 It didn’t take the girls long to figure out how to climb up the ladder to go inside of their coop, with the exception of two of them. (I quickly had flashbacks of my first flock of chicks, with me chasing ‘Renny Henny’ around the chicken run at bedtime.) Sometimes a couple of chicks are a little slow to figure things out, but they eventually learn! One other thing brings back memories of my first flock of chickens. Those ‘hungry eyes’ I keep seeing lurking around the chicken pen! 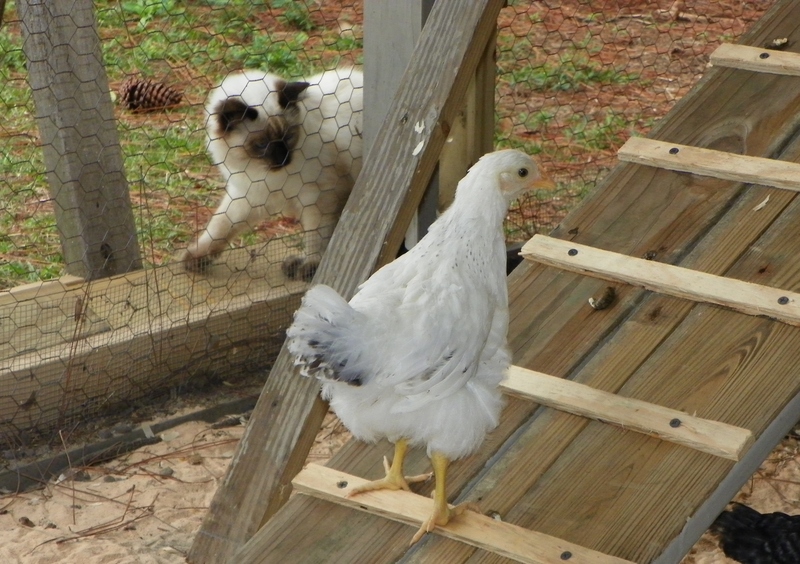 Just like before, some of my cats are obsessed with trying to get inside of the chicken run! It’s no wonder the chicks like it better inside of their coop! The girls have spent three nights in their new home, and I think they love it! I can see them out there, at night, (thanks to that ‘picture window’) playing when they should be sleeping! They’re going to be sad when they lose their light bulb (heat source) once they turn six weeks old. 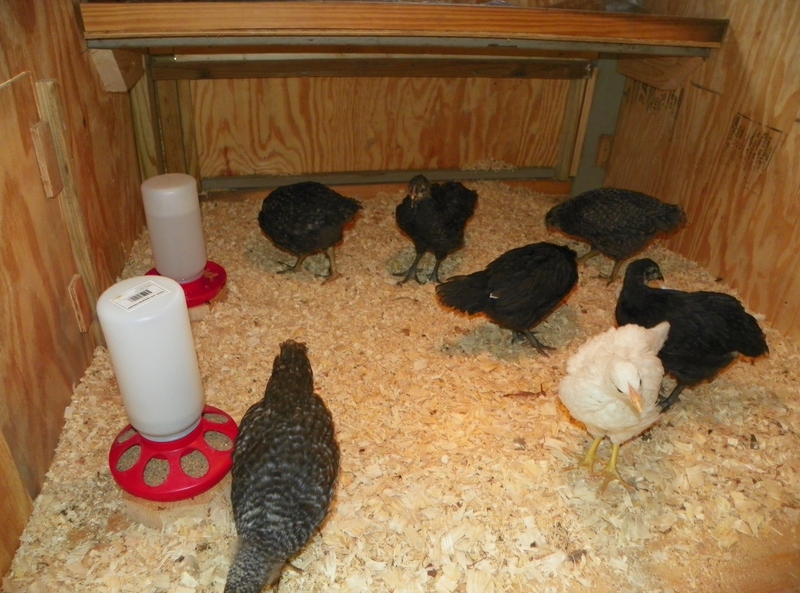 They’ll be fully feathered, and will need sleep more than heat, by then. As for me, I’m slowly getting used to the quietness of the house again. I miss the little chirping sounds baby chicks made. I think my parakeet, ‘Tweety’, probably misses them, too. Yesterday, I heard him actually imitating their little chirping sounds! Many years ago, when I used to work in a classroom, as a paraprofessional, one of my duties was to change the bulletin boards in the classroom each month. Each month’s bulletin board always had a different theme. I always enjoyed finding and celebrating something special about each month, and, one day, decorating all of those bulletin boards gave me an idea! I got the idea to begin the tradition of decorating a ‘year round’ tree, at home. I bought a tall, skinny, artificial tree and started collecting things to decorate it with. At first, my family thought I’d lost my mind (keeping a tree up all year? ), but, now, I think they enjoy seeing the different decorations on the tree, each month, almost as much as I do. I decided, each month, my tree would have a different theme. I’ll have to admit, it took me a while to figure out what some of the themes would be, but, eventually, I settled on a theme for every month. For instance, January is snowmen, February is Valentine’s Day, March is St. Patrick’s Day, etc. The summer months proved to be the toughest to choose themes for, with the exception of July, which is patriotic themed. For the month of August, my theme is ‘summertime’–and nothing says ‘summertime’ more to me than the beach. 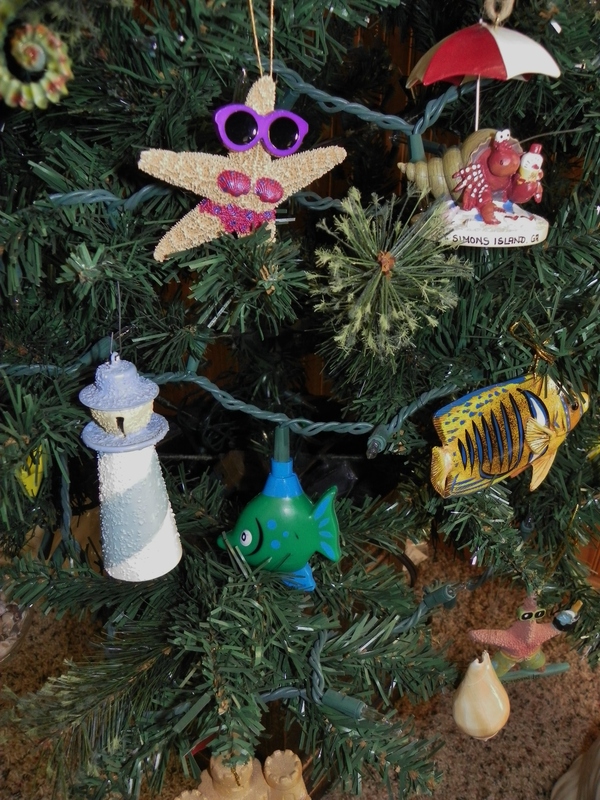 My summertime tree decorations are among my favorites because they remind me of the beach. 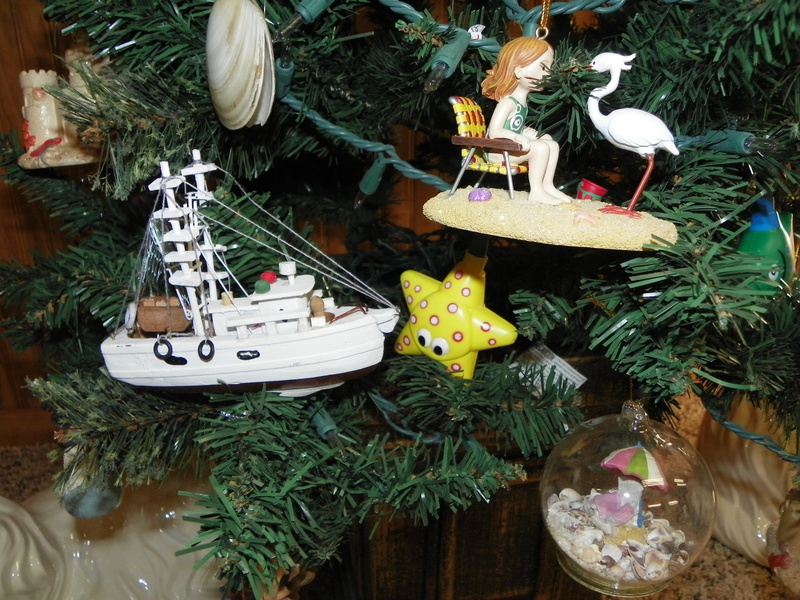 Most of the ornaments came from little shops at various beaches, particularly St. Simon’s Island, since we visit there most often. 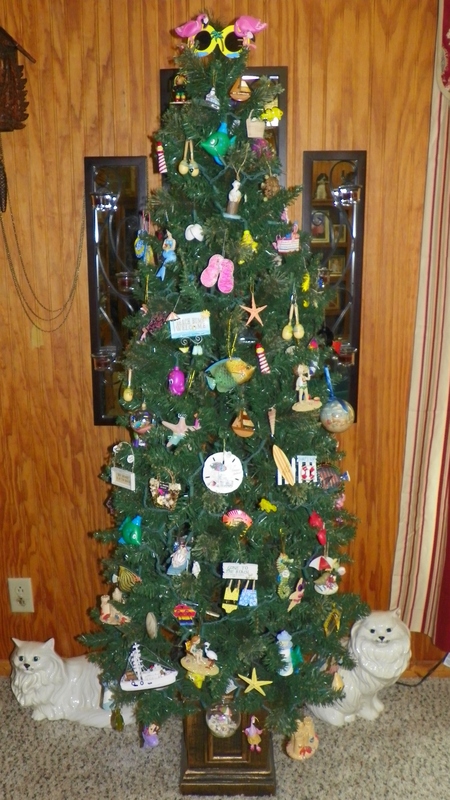 I’ve decorated the tree with sand castle ornaments, actual sea shells, and even a miniature replica of a shrimp boat! The little girl sitting in the lawn chair is one of my newest (and most expensive) ornaments. The glass ball filled with sand and shells came from Tybee Island. It’s a souvenir of one of the beach trips I’ve taken with my friend, Diane. 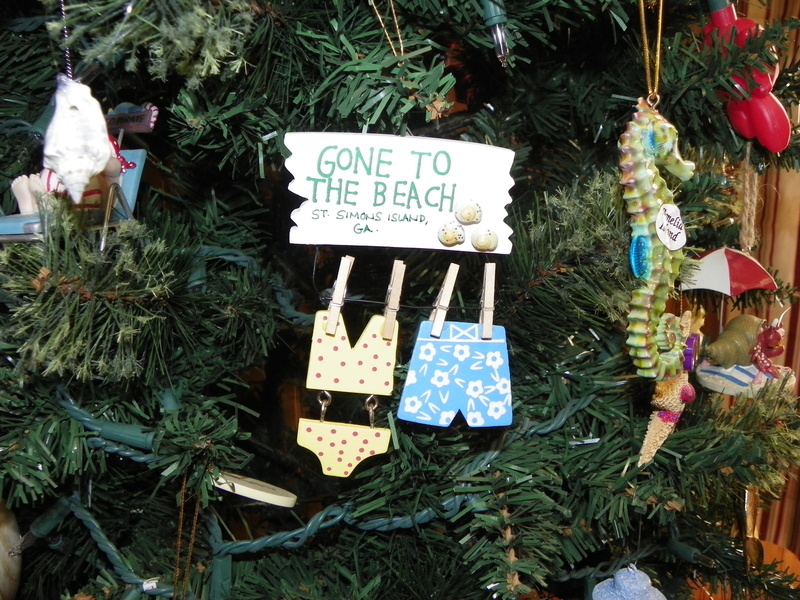 This ‘gone to the beach’ ornament is one of my older ones, and is among my favorites. Of course, it came from St. Simon’s Island! The sea-horse ornament, to the right of it, came from Amelia Island. I bought it on one of mine and Ed’s anniversary trips there. 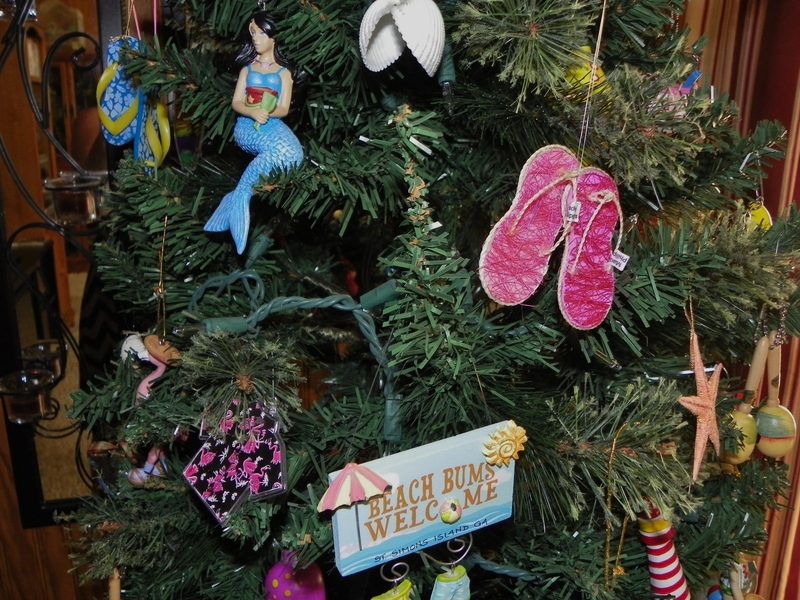 Of course, nothing says ‘beach’ like flip-flops, and I have a few pairs of those for ornaments, as well. The mermaid came from eBay, and the white sea shells at the top of the picture were found on Fernandina Beach. Did you notice the little maracas to the far right? Here’s a view of one of the sand castle ornaments, along with one of my fish ornaments. 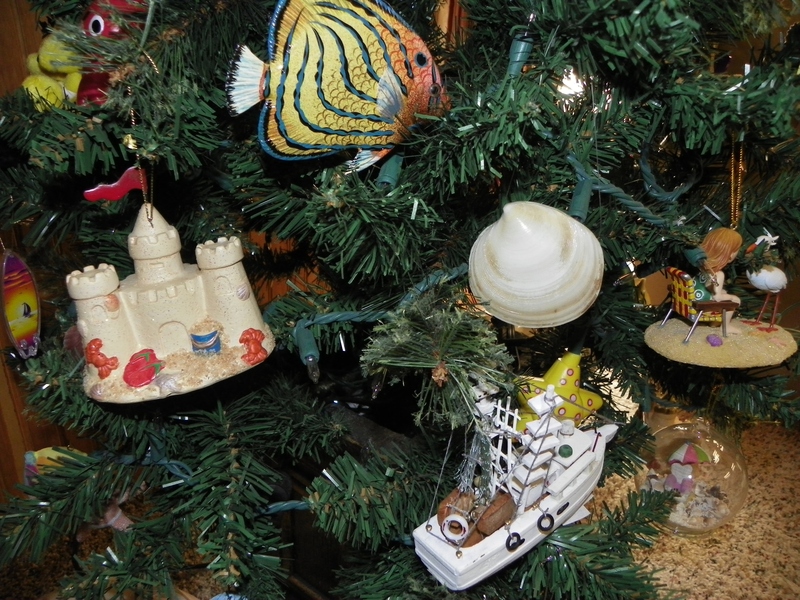 I have several different kinds of fish ornaments scattered about the tree. There’s a tiny surf board to the left of the sand castle, as well. Of course, my tree wouldn’t be complete without a light house, so I have a couple of different kinds of those, too. The one shown in this picture came from Amelia Island. Speaking of ‘light’, the little green and blue fish lights up! I enjoy looking at my ‘summertime’ tree decorations each day. Whenever I feel the need to go to the beach, I just look at the summertime tree and dream! 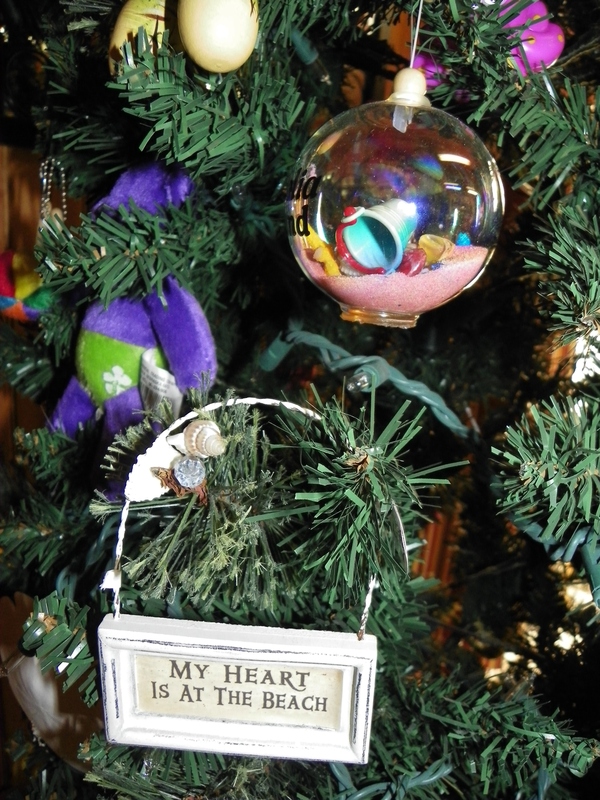 The sign on this little ornament says it all… my heart is always at the beach! Forty-two years ago life was good! It was June of 1972, and I’d just graduated from high school. I was less than a week away from marrying the man I’d been engaged to for almost two years, as well! Did I mention that Ed and I had only recently been reunited after spending almost two years apart?! It was a time of changes, but they were all good, at least as far as I was concerned! Not only was I finished with high school, and about to get married, I was preparing to move to a new city, too! Ed had recently finished his time in the military, and found a job in a hospital, located sixty miles away from our hometown. A move was definitely in order for the two of us! Within three weeks of graduating high school (at the ripe old age of 17), I was married and transplanted to a strange city! Oh, how I loved the excitement of it all, though, and I still consider the early seventies as some of the best years of my life! The 70’s were a time like no other. 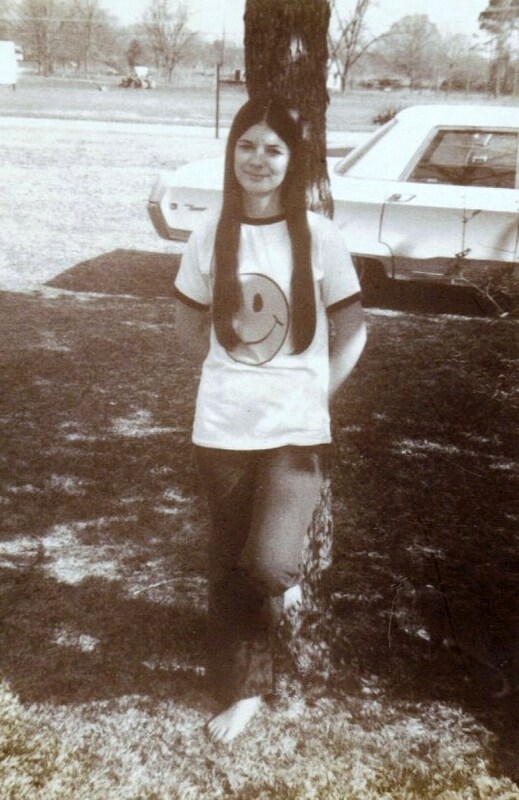 A time of bell-bottomed jeans, and smiley-faced t-shirts. The 70’s were a time of bikinis, ‘hot pants’, ‘scooter skirts’, halter tops, and ‘go go’ boots–and I wore them all, even though I’m sort of ashamed to admit it, these days. What was I thinking? Long hair was all the rage, in the seventies, on both men and women. I grew my hair down to my waist, and wore it straight and parted down the middle. I wore my hair this way through the first half of the seventies, when I suddenly opted for a short, shaggy hair do! Ed was sad about my decision to have my hair cut, but having short hair felt so much better and was so much easier, I never grew it out again. Speaking of hair in the seventies, Ed’s hair was thick, curly, and a bit unruly, so he never grew it very long–except on top. Ed’s hair had a mind of its own, and it flipped and curled every which way, except the correct way! Each night he’d shampoo his hair, then comb it over to the wrong side to dry, which he claimed made it lay down better the next morning. The seventies’s was a great time of music! Some of the best music, ever, was written and recorded in the seventies (in my humble opinion). The Guess Who, Carole King, Jame Taylor, Elton John, Jim Croce, Three Dog Night, The Bee Gees, The Carpenters, Bread…I could go on and on with a list of my favorites. A large stack of old vinyl records still sits in a corner of our house–and I still play them, occasionally, believe it or not! Two of my all-time favorite bands, The Eagles and the Doobie Brothers, became popular during the 70’s, too. Ed took me to see each of these bands in concert, and I was thrilled! I’ll never forget, while we were standing in line at one of these concerts, Ed said to me, “Do you smell that sickening sweet smell? That’s pot!” I was shocked because I had no idea what ‘pot’ smelled like, or that anyone would dare smoke it in a public place! I was (and still am) a naive person. Ed and I started out our marriage with a [hand-me-down] black and white television set, but when it died, we soon established our first line of credit to buy a new television. We purchased a 19 inch color television from K-mart–and we made payments on it until it was paid for. We thought we’d done something big! I still remember watching ‘The Price Is Right’ (when Bob Barker actually had black hair), watching the premiere episode of ‘The Young and the Restless‘(with a young David Hasslehoff playing ‘Snapper’ Foster), as well as the very first episodes of ‘The Waltons’ (Ed never liked John-Boy!) on our new Zenith color television! The seventies heralded the last era of muscle cars, and oh, how I loved a fast, sporty car! GTO’s, Roadrunners, Firebirds, Chargers, Mustangs, and more! Gas was cheap back then, and speed and sportiness was what counted. Ed and I had a 1970 Chevelle , with black racing stripes on the hood, and a ‘four-in-the-floor’, which I didn’t know how to drive! (We owned that car for over four years, and I never learned how to drive it.) By the way, the air conditioning, in our car, was referred to as a 4-60 model–four windows rolled down, going sixty miles per hour! 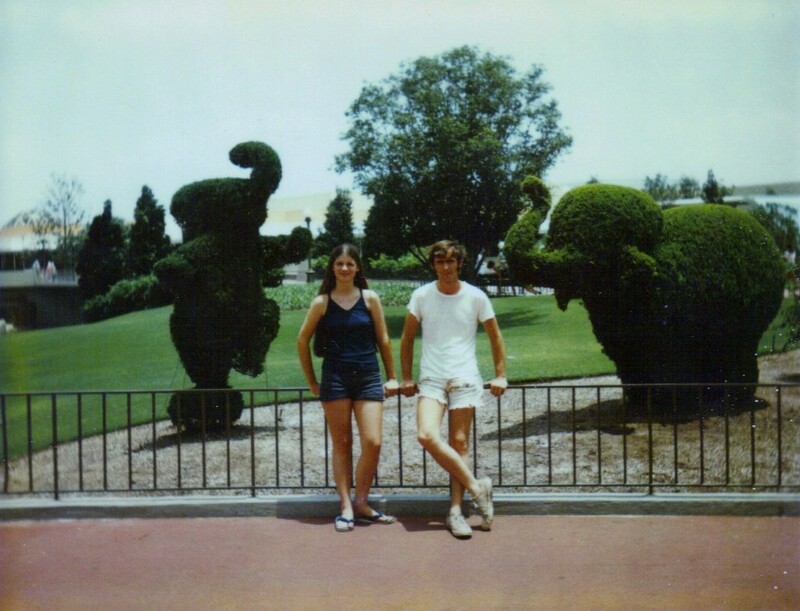 We were cool–NOT! I could sit here and reminisce all day about my favorite era, the 70’s, but time’s passing quickly, so I’ll stop and get busy before 2014 is gone. Yikes, I can’t believe the year is already half over! Before we know it, it will be 2020… Speaking of 2020, I’m reminded of another great song , released just prior to the 70’s… The lyrics kind of send a chill up my spine, especially with all that’s happening in the world today! How about you, do you have any special memories of ‘the seventies’? Those were ‘the days’! Ed and I are continuing to sort through the items left behind at his parents’ house. It’s been a slow and painful process. We sort in small amounts because it tends to make both of us a bit sad and depressed. The thought of disposing of the things in the house makes everything seem so final. At times, we just have to step back and take a break from it all. It’s been 8 1/2 months since Ed’s mom passed away, and our feelings are still raw. We’ve cleaned out and sorted all of the closets, cabinets, drawers, and other storage places. Most things we placed on counter tops and tables so his brothers could see what all was there as they made their journey through the house to choose what they wanted to keep. The past two weekends, the brothers went through the house to take what they wanted. As I mentioned, yesterday, Ed and I were surprised at some of the things his brothers didn’t choose to keep–the flags from both of their parents funerals, and the aerial photograph of the family farm. I’d asked Ed, early on, if he’d like to have his daddy’s flag, and he replied that he felt sure his brother would want it. I guess Ed was wrong. Most of what we’ve taken from the house were items of sentimental value. I wanted Ed’s mom’s jello molds and Buster the cookie jar, while Ed claimed the cedar chest that he made in high school, as well as his old bedroom suit. I took back the set of china that we gave Ed’s mama for Christmas, one year, and I chose some stainless flatware to go with it. I chose a few random dishes from her kitchen that meant something to me, too. Ed’s brothers claimed many items, much of what I considered to be ‘trash’. I guess you just never know what will mean something to someone else! Of course, many things of monetary value were chosen, as well. Many, many items remain to be disposed of. I suppose at some point, we’ll begin to sell some stuff off, but the thought of doing this is still pretty painful. Once something’s gone, it’s gone. We both know how hard Ed’s parents worked to acquire the things they had. Their home and the things in it meant a lot to them, and while those things may not be worth much to anybody else, they still mean a lot to us! The over-looked flags have found a place of honor in our home. I’m proud of the fact that both of Ed’s parents were veterans. Those flags mean something to me! 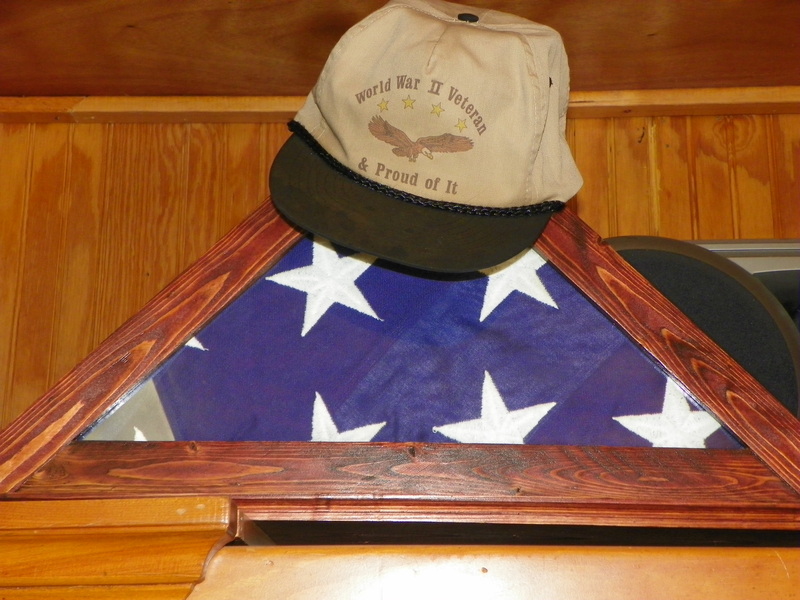 Ed’s mom had her husband’s flag framed, after he passed away. It sat in a place of honor, in her den, for twelve years. Today, the framed flag sits in our home, along with her flag, as well. 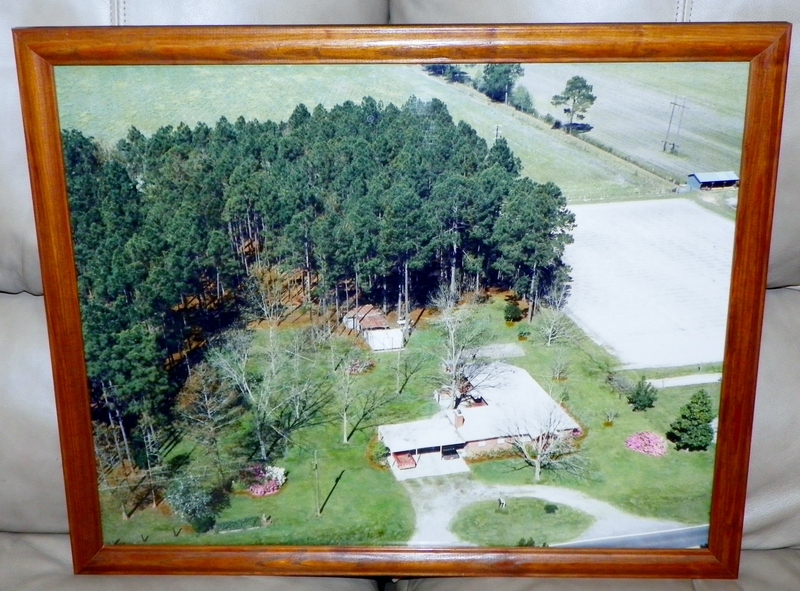 I claimed the aerial photograph of the family home and farm, too. It, too, will have a place of honor on the wall. I still remember the tale of how the entire 30 acre family farm and house was purchased for $3000, back in the 1940’s! The house wasn’t finished on the inside, so Ed’s daddy did the work himself. We have old family photos of the family home, during different stages of renovation, throughout the years. Ed has good memories of helping his daddy work the fields of the family farm, while he was growing up, too. I don’t know what will eventually end up happening with the family home and the plot of land it sits on. For now, only God knows how that scenario will play out. The rest of the farm was divided between the brothers, before Ed’s mom passed away. For now, the old family home sits empty and forlorn, with only ‘Trouble’, the old cat, to keep it company. She still considers it home. We do, too. Life was very good for this prominent man and his family– until the man’s wife and daughter were both killed in a plane crash, while on a trip together. Suddenly, one-half of the man’s family was gone! This event rocked our little town, back in the late sixties, and I’ve never forgotten it. I’d be willing to bet most of the other folks in this town haven’t forgotten it either! It was the only time, in my fifty-nine years, that I remember anyone from our town getting killed in a plane crash. Life goes on, but the man was never the same after suffering such a blow. His son grew up, but went through a few tough times along the way. The grocery store eventually closed, and was turned into a thriving local pharmacy, ages ago. The beautiful home still stands, on the corner, but is now owned by another family. Time marches on, and things change. 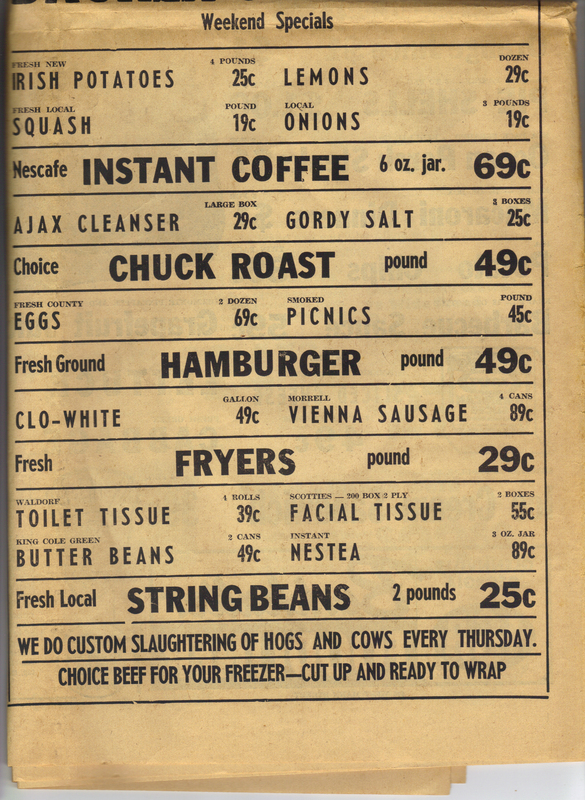 Speaking of things changing–take a look at the food prices back then! Man, those were the days! 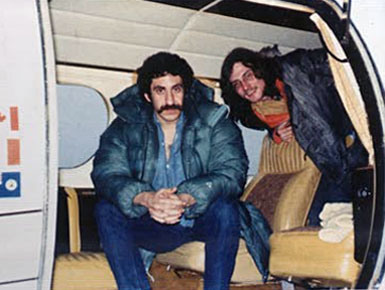 After two weeks, I finally finished the autobiography of Jim Croce, entitled I Got a Name – The Jim Croce Story! 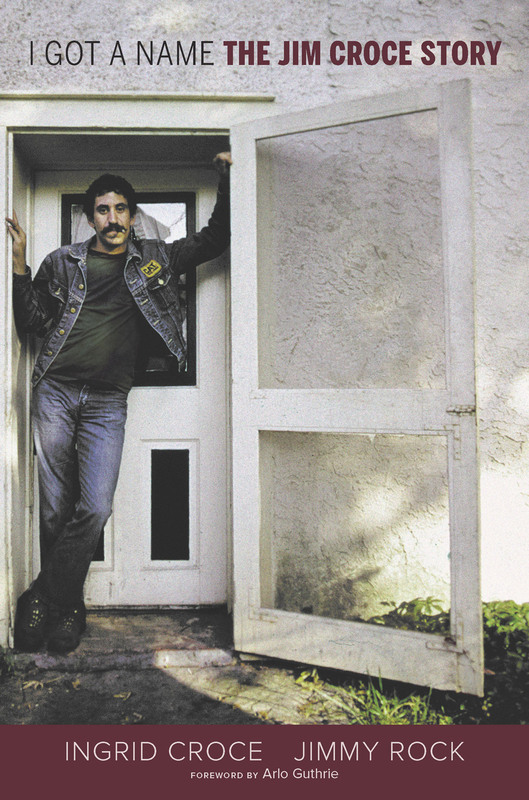 I’ve been a long-time fan of Jim Croce’s music, and owned all three of his last albums, back in the 70’s. I played them constantly, and still remember most of the words. I, like so many other fans, was heart-broken when Jim’s life was claimed in a plane crash, en route from one concert venue to another. Jim died at the age of thirty, just as his career was beginning to sky-rocket, leaving behind a wife and two-year-old son, Adrian James, now known as A.J. Jim began his journey with music, at the tender age of five, by learning to play the accordion! Jim was a college graduate, but preferred to play, write, and sing music, above all else. Jim’s decision to play and sing [for a living] caused a rift between him and his dad. That rift never really healed since Jim’s father passed away before Jim became really successful with his music career. Jim played and sang folk songs, while he was in college. He met his wife-to-be, Ingrid, during a ‘Hootenanny’. (She performed, while he was a judge.) Jim was in college, and Ingrid was still in high school, at the time. They later married, while Ingrid was studying art, in college. The two began playing and singing together whenever and wherever they could. They wrote several songs together, as well. In addition to making music, Jim’s various other jobs included: selling radio ads [in the black section of town] , writing radio commercials, working on a construction crew, truck driving, and even teaching some very rowdy special ed students! He wrote several of his songs based on some of these experiences. Jim wrote virtually all of the songs on his three albums from the 70’s. He was a talented song writer, who used his life experiences to make lyrics for some great songs. He carried a pen and notebook with him at all times. He frequently carried a tape recorder, as well. In order to avoid being drafted, Jim joined the Army National Guard two years before he and Ingrid were married. Unfortunately, he wasn’t ordered to actually report for basic training until exactly one week after their wedding! Jim hated Army basic training! His wife states “Jim didn’t take directions easily”. Ultimately, Jim was forced to repeat basic training for a second time, even though he passed all of the tests the first time. Jim met a man named ‘Leroy Brown’ while he was in basic training, who helped inspire the song Bad, Bad Leroy Brown. Jim, also, received inspiration for the song “Operator”, during basic training, while waiting in line [with the other recruits] to use the pay phone. He once struck up a conversation with the operator, while making a call, [to buy some time] because Ingrid’s line was busy and he didn’t want to give up his turn in the phone line. Jim drove a VW Beetle, for years, that he and Ingrid eventually referred to as, “The Raisin”. 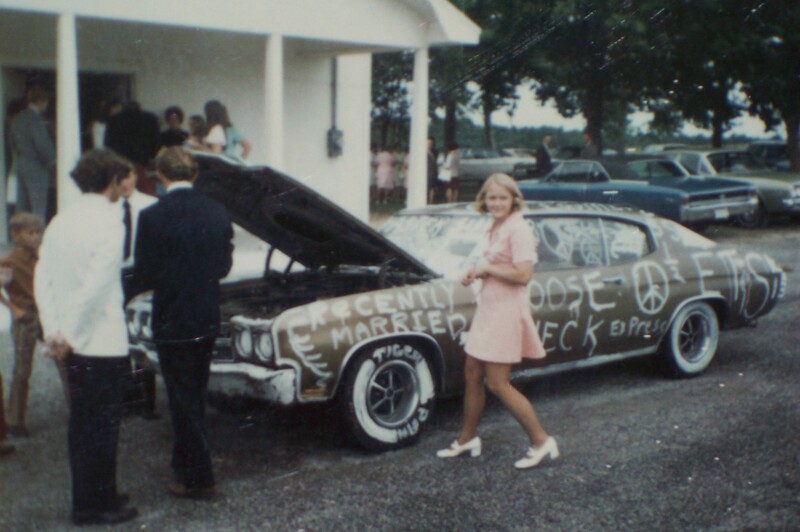 The car became filled with dents at the hands of some of Jim’s special ed students, and Jim spray painted the car brown to help hide the dents. This made it look like a raisin! (During this time, Jim’s tires were also slashed five times!) Following the eventual demise of ‘The Raisin’, money was tight, and Jim proceeded to purchase thirteen different ‘clunkers’ within the next twelve months! His streak of bad luck with cars, was the inspiration for a song–‘Hard Time Losin’ Man’. One day, Jim’s friend, and former college classmate, who had become a record producer, in New York, contacted Jim and offered a record deal. (Jim and Ingrid had been playing and singing at coffee houses, colleges, and such.) Jim and Ingrid then moved to New York to pursue a music career, which didn’t flourish, at that time. The song, ‘New York’s Not My Home’ was inspired by this experience. Jim was a trusting soul, and refused to read the recording contract, or even get a copy of it when he signed it. Ingrid questioned this decision, but eventually signed the document, too. Both of these decisions came back to haunt them. As a result, Jim received very little monetary compensation for his music, even after his music career finally began to take off with the release of ‘Don’t Mess Around With Jim’. Ingrid went to court, following Jim’s death, and, finally, after ten long years of litigation, won the rights to Jim’s music (some of which she co-wrote). 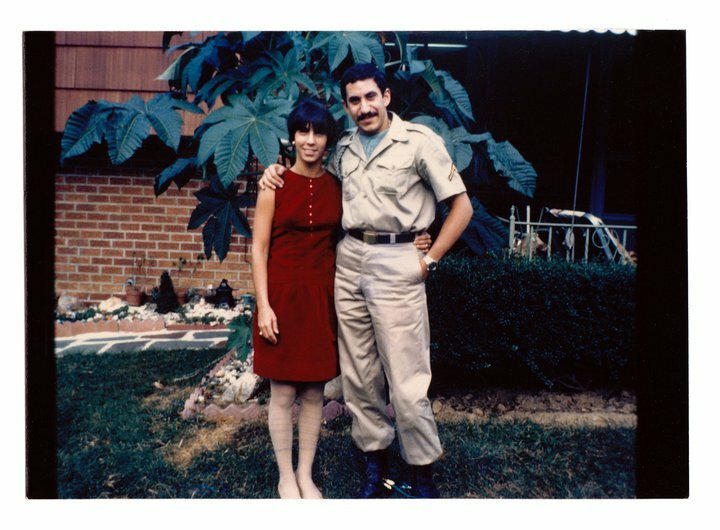 If you are a fan of Jim Croce’s, you would enjoy his autobiography. Once I finished the book, I was still curious, so I did a little Google research. I discovered that, following Jim’s death, his wife, Ingrid, became very accomplished in many ways. Among many other things, Ingrid developed a Head Start program for Costa Rica, opened a children’s school, and wrote a children’s book! Ingrid, also, renewed her singing career, and recorded a couple of albums after Jim was killed. Eventually she was forced to give up singing, due to a tumor on her vocal cords. Ingrid then opened a very successful restaurant/jazz bar in San Diego, California, in 1985. She located her restaurant in the same spot where she and Jim had once discussed opening a “Croce’s restaurant/jazz bar” together. She named the restaurant Croce’s, in memory of her late husband. The business was expanded five times, in the years that followed! Ingrid decorated Croce’s with memorabilia from Jim’s career, which was a good thing, because her house burned down about the time she was preparing to open Croce’s! 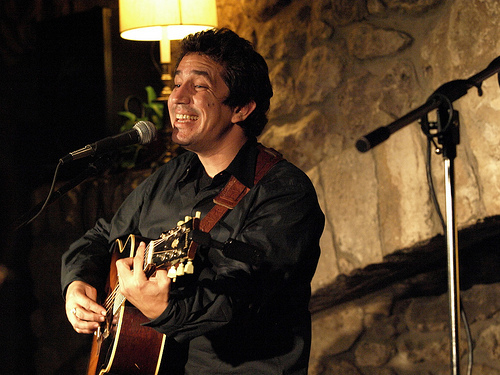 Over the years, Croce’s became a favorite spot for Jim’s fans to come and remember him. Unfortunately, Croce’s was forced to close its doors, in December of 2013, after the landlord refused to renew the lease. Ingrid has since opened a second restaurant, Croce’s Park West. I, also, discovered that, after the death of his father, A.J., contracted a brain tumor when he was about four years old. The tumor caused swelling to the optic nerve, which left A.J. blind, for a time. Fortunately, by age 10, A.J. was able to regain sight in one of his eyes, but A.J. became an accomplished pianist while he was still blind. A.J. sings and plays the guitar, as well. A.J. has recorded several albums, and now owns his own record company, too. By the way, I think A.J. resembles his late father a lot!